Lovely rural cruise along the Coventry canal and then down the North Oxford Canal, passing through quiet countryside and open fields and hills in the distance to the canal village of Braunston with its moored craft and houses of all periods. The Coventry Canal Basin opened in 1769, on the side of a hill, overlooked by buildings such as old wooden canal warehouses, dating from 1914. Coventry's crowning glory, is its Cathedral. Designed by Sir Basil Spence, and completed in 1962, it is pretty spectacular. The font is a boulder from a hillside near Bethlehem, and stands in front of the Baptistry window. The original old Cathedral was destroyed by the Luftwaffe in 1940, but the ruins remain, along with some of the original stained-glass windows. There are many interesting things on display in the ruins, and there is a Blitz Experience Museum with 1940's room reconstructions. The Herbert Art Gallery and Museum houses works by Turner, Constable and Lowry, among others. 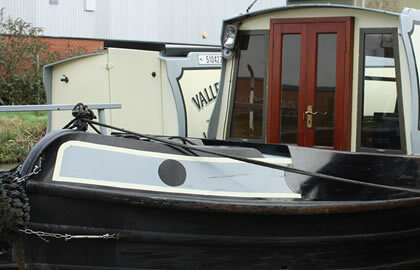 Leaving the Canal Basin, you will be heading for Hawkesbury Junction (also known as Sutton Stop), about 4 miles away. The canal is quite narrow in places, as you cruise through busy industrial areas. Beyond Bridge 2 are 'Cash's Hundred Houses', a pretty row of former weavers' houses. 37 of the original 48 now remain. Just above New Inn Bridge No. 8, there is a Tesco store, which would be a good place to stock up on provisions, if you've not already done so. The canal takes you through a hairpin bend to the right, then a little further, a wide curve to the left, as you approach the outskirts of Coventry, widening a little as you near Bridge No. 10. This is at Longford, the original junction of the Oxford and Coventry Canals. Soon, the motorway will be ahead of you, and just beyond it, is Hawkesbury Junction, where you will see many traditional boats, an engine house and useful facilities. To the east of the Junction you can see Hawkesbury Hall, now a private house. There is a pub at the Junction, called The Greyhound, a traditional canalside pub, dating from the 1800's, which serves food and real ales. There is a garden and mooring here, and children are welcome. You will have cruised about 4 miles, in around 2 hours. From Hawkesbury Junction, you will now be heading towards, Bridge No. 84, which is 20 miles away. Firstly when you leave the moorings, you will go under the M6 Motorway Bridge, then turn right onto the Oxford Canal. On this stretch of canal, the Motorway runs alongside, to your right, until you reach bridges 7 and 9, where the canal veers off to the left. However, at M69 Motorway Bridge No. 13A, you will again go under the Motorway, on your way to Ansty. Other than the distant noise of the Motorway, the landscape is pretty remote, with just the odd farm here and there. Ansty is a small picturesque village that grew up next to the canal. Ansty Hall is a popular location for weddings and other events, and is dated 1678. There is a pub in the village, called The Rose and Castle, serving food and real ales. Children are welcome, and there is a large play area in the canalside garden. Moorings and water are also available there. Moving on, through a couple of small aqueducts, rolling fields flanking the canal, you will again pass under the M6. Soon you will reach Stretton Stop, with the Stretton Wharf to the left. If you want to, you can moor up here and make your way into Brinklow, a pre-industrial village, with a motte and bailey mound alongside the C15th Church of St John. There are a good selection of pubs here – The White Lion, a traditional coaching inn, children and dogs welcome; The Bulls Head, a family pub; The Raven, also family-friendly – to name just three. Cruising on through pretty farmland, you will soon pass All Oaks Wood to your right. There are moorings here if you want to go exploring. A little further, and to your left, you will see a quiet little village called Harborough Magna. Very shortly, you will approach Newbold Tunnel, which is 250 yards long, and as you emerge from it, you will be in Newbold-on-Avon, on the outskirts of Rugby. If you want to moor up and take a look around Rugby, there is much to see, including The Webb Ellis Rugby Football Museum and The Rugby Art Gallery and Museum. As you cruise on, you will notice that to the left is mostly open countryside, whilst to the left it becomes more built up again as you approach Hilmorton. By Hilmorton Visitor Moorings alongside the canal is a pub called The Old Royal Oak (by Bridge No. 73, with its own moorings), serving food all day, real ale and has a children's room and play area. Also nearby, is Canalchef Cafe, a licensed cafe with a beer garden. Cruising through a largely isolated and quiet stretch of canal, with fields flanking the canal, the peace will be temporarily shattered by the noise of the M45 at Barby, as it crosses the canal. Then a wide curve to the right around Barby Hill, onto a straight stretch of tranquility as you approach Willoughby, a small village to the right of the canal. 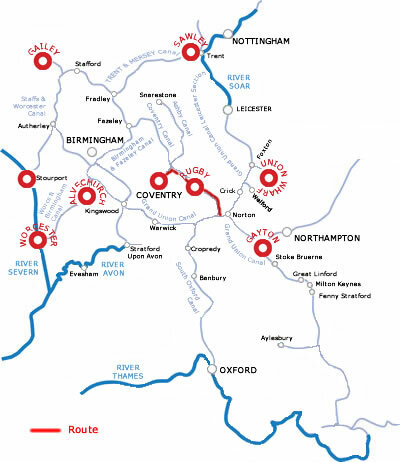 A little further on, and you will reach Braunston, and Braunston Turn, the junction of the Grand Union, Oxford and Grand Junction Canals. Braunston is set up on a hill to the north of the canal, and is a popular canal centre. The village has houses of all periods, and is predominantly one long main street. Just beside Braunston Marina, is a cafe in a narrowboat, called *The Gongoozler's Rest, serving breakfasts, sandwiches and more. There are also a selection of pubs, including The Wheatsheaf, The Old Plough and The Boathouse.